Welcome to Incentive Plan, One of the UK’s leading specialist in corporate incentives. We are an Incentive House that is dedicated to improving the performance of your employees through a variety of incentive experiences which includes various team building activities and incentive travel programmes. Incentive Plan are experts at developing diverse and memorable incentive programmes, with an unparalleled commitment to customer service in order to produce outstanding results for our clients. Incentive travel is a unique and fantastic way to reward your staff and motivate them at the same time. This type of incentive lives long in the hearts and minds of those that take part. We have a vast range of incentive programmes, or we can simply create a trip completely tailored to your organisation and most importantly, budget. Let the Incentive Plan team help you inspire and motivate your colleagues, we offer a highly bespoke and tailored service when creating our incentive travel schedules, we can provide fully escorted groups throughout the UK to literally anywhere in the world, our destination expertise and knowledge is unrivalled. Whether you are looking for something stimulating but simple, such as a city trip with sightseeing activities; a high level business meeting or conference coupled with the opportunity to unwind or a chance to challenge and stretch participants. We can guarantee your delegates will return motivated and inspired having had the opportunity to do something that will live with them for a very, very long time. We have a wide selection of events on offer. Whatever your group size or budget our expert team will put together a bespoke package to meet your needs. Incentive Plan are specialists at developing diverse and memorable team building and incentive programmes. We provide team building days, fun business events, staff entertainment, company team exercises, corporate outings and incentive days to reward staff. This often involves fun days away from the office and interactive, sometimes quirky participative events. All our team building events and programmes are designed to help bond your team and build a team vision to take back into the workplace while having fun. Offering incentives encourages hard work and dedication within your workforce as your employees feel their efforts have been duly recognised. It’s a great way to increase the performance of your workforce. We offer effective solutions to the incentive and motivation needs of your organisation – whether large or small. 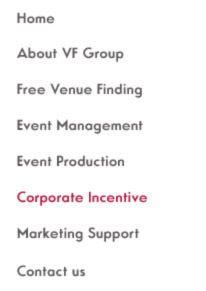 VenuefindGroup website copyright © 2010-2015 Copyright House Limited. All rights reserved.